We'll start by picking up two scrolls and...what a sham, we don't know what they do. If we were to read them, we could find out, but doing so consumes the scroll, so we'll just hold on to them for now. Let's take a gander at the stats displayed and learn a bit about Testy. This is your general information screen, has our name and title, followed by race, god, and piety level (1 asterisk is one level.) Next is our hitpoints and magic, then our primary stats (Strength, Intelligence and Dexterity) with our defensive stats (armour class, Evasion, and Shield, higher is better) then our experience level, how much experience we have gained towards the next level and where we are (Dungeon:1 is the same as D:1. )Gold count, turn count, weapon, and Quivered item are self-explanatory. I'll go over things like AC and Evasion in a future installment, but for now, know that we're not half bad. 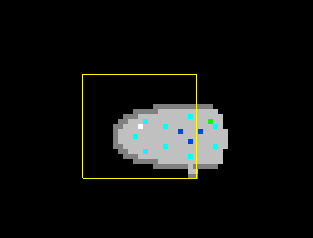 This is our minimap of the level we're on, the white dot is us, blue dots are stairs out, yellow dots are decoration. Other colors, like red for enemies, are also used. The message window is where the game tells you what happens in between inputs Foo misses you, You feel uneasy, whatever. 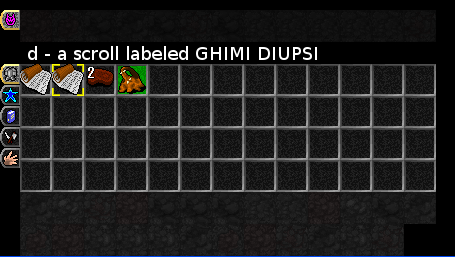 Our inventory, two scrolls we just picked up, two meat rations, and an animal skin. It'll fill up. The spells tab is above that, but we don't have any, our 3 int and Trogs hatred of spellcasters means we probably never will. That's us, you can customize the tile for your character, but I don't bother, it does change based on what you're wearing, so once we find more suitable garments, the tile will change a bit. That's the wall, a rock wall at that, we'll be seeing other types, but rock walls are the most common and are our best friend early. The darker, gray tiles are floor, obviously. 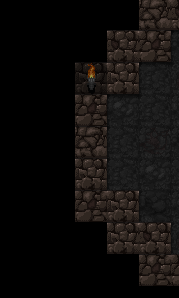 The special type of stairs up that only appears on D:1, using those ends the game, either retiring your character or ascending if you have the Orb of Zot. We won't be using that for some time. Also in the picture we can see the end of our vision, things outside of this are not updated and unseen. On our race and class, we're a Troll, monstrous humanoids who rip and tear but not much else. 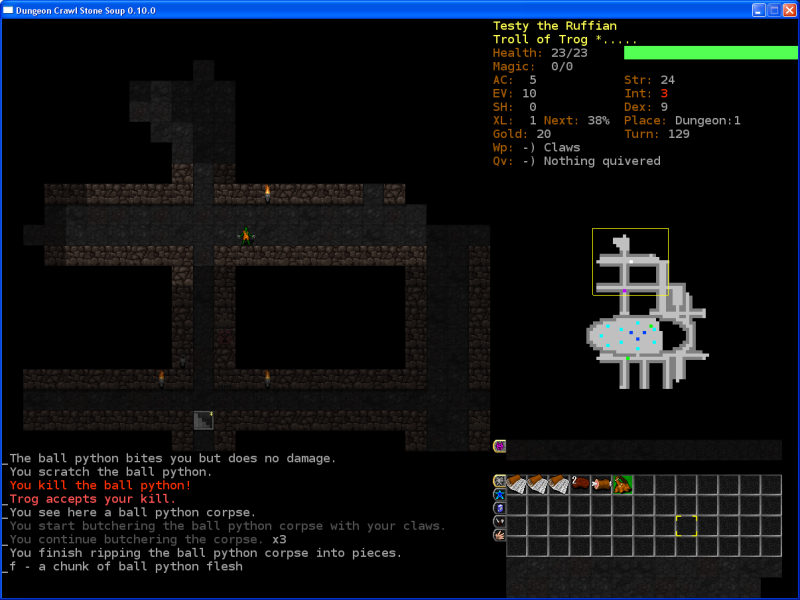 They hunger fast but their amazing strength and ability with claws makes trolls very powerful early. 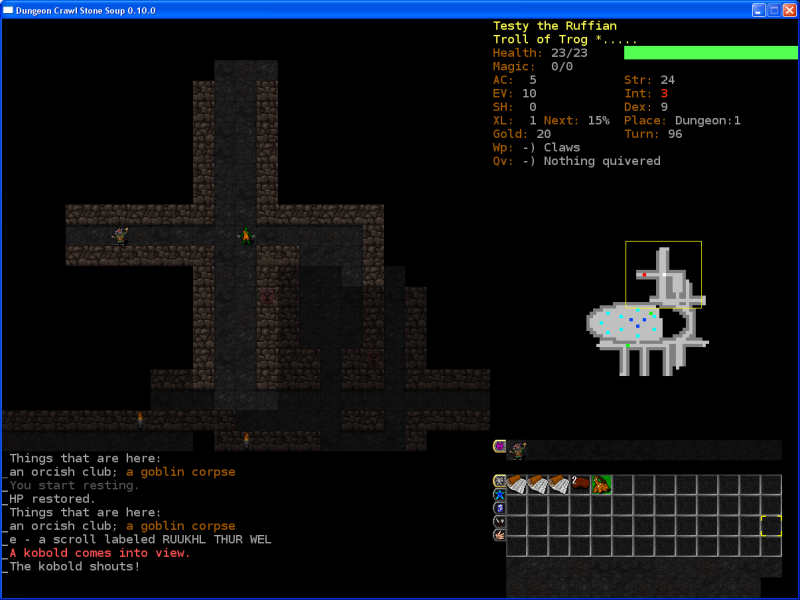 Beserkers start with very little, typically just some food, an animal skin and a weapon (which we, as Trolls, have forsaken for now.) Beserkers are the ultimate kill it first though because they don't split their skills between armour and damage. To this end, they start off the game worshiping Trog, god of slaughter. While most classes don't start off with a deity, they can pick one up pretty early, but Troglodytes hit the ground running already with his first pip of piety, allowing them to beserk. Yes, a beserk Troll is as nasty as it sounds. 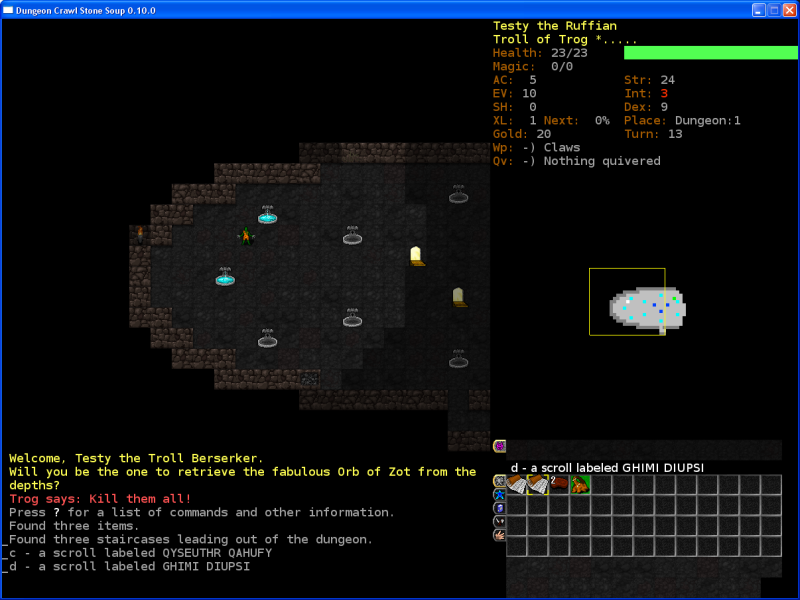 Now that we understand the interface and our race/class, lets explore the dungeon. A kobold! Though not much of a threat when alone, kobolds tend to have darts or slings to pelt you from a distance, making them annoying and a good source of embarrassing deaths. 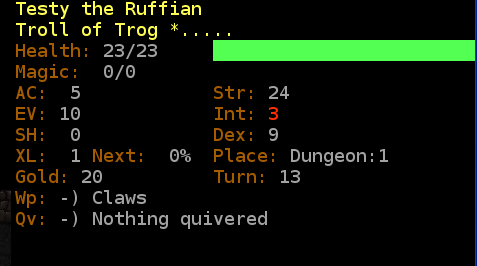 Fortunately we are able to dispatch of this one easily and we get the message Trog accepts your kill meaning that our relationship with Trog has gotten better. Afterwards, we kill a ball python (a small snake) and it leaves behind a corpse, we can butcher it using our claws with "c." We do so, and continue on. Further exploration leads us to find a pair of gauntlets, armour that grants +1 AC, but we can't wear because of our visceral claws. Oh well. Later, we get hungry from all this killing, but our snake chucks have rotted and are no longer good. However, we just butchered a rat after killing it, so we can eat it. 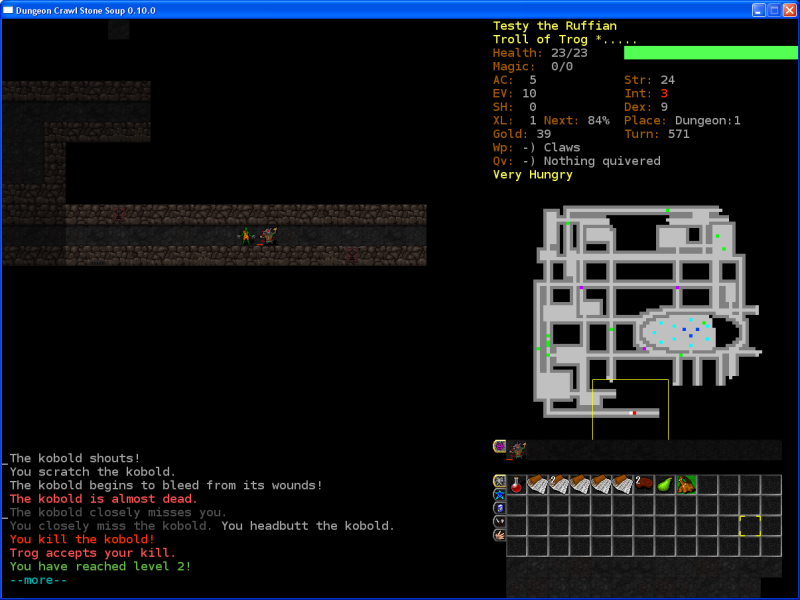 As Trolls get hungry faster than most other races, it's always a good idea to have some fresh chunks of meat on hand. 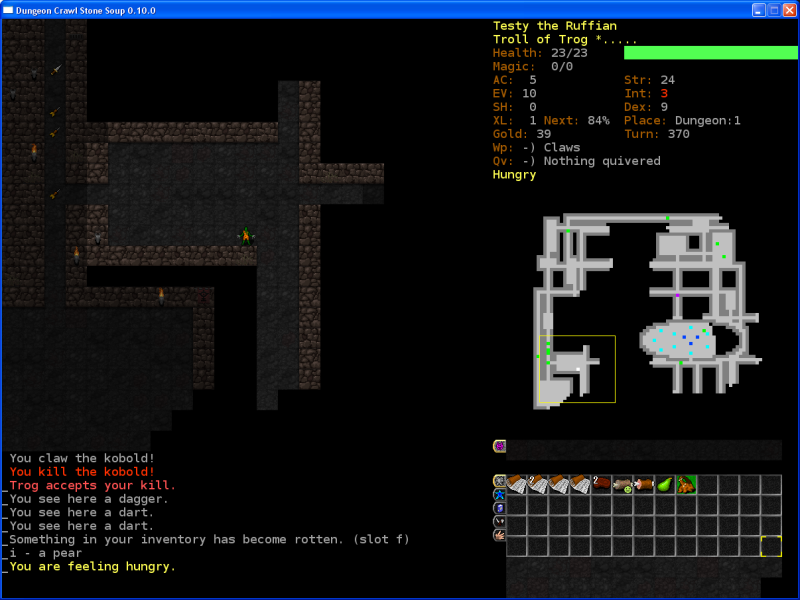 What's more, the beserk ability makes you more hungry and the more hungry you are, the less effectively you can fight. Yay! Level 2 means an increase in hitpoints and a few other things. 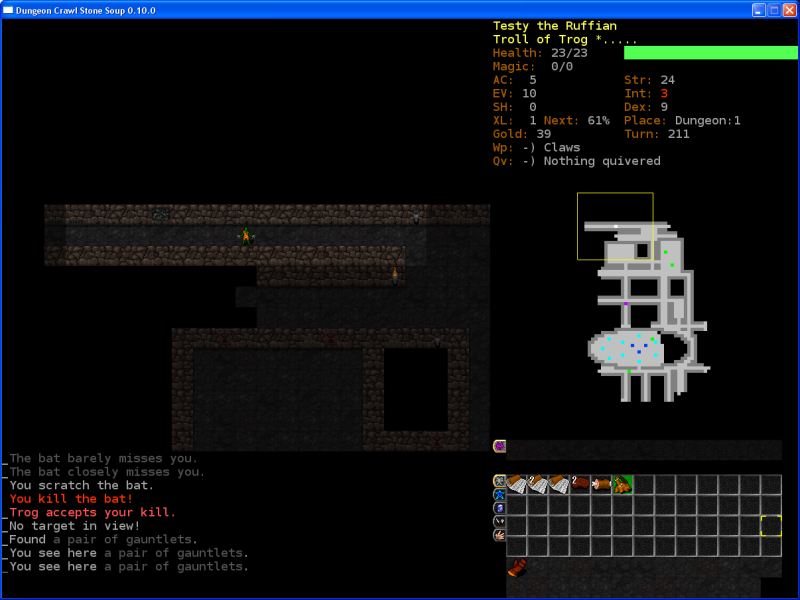 Most notably, every few levels you get an increase to one of your stats. 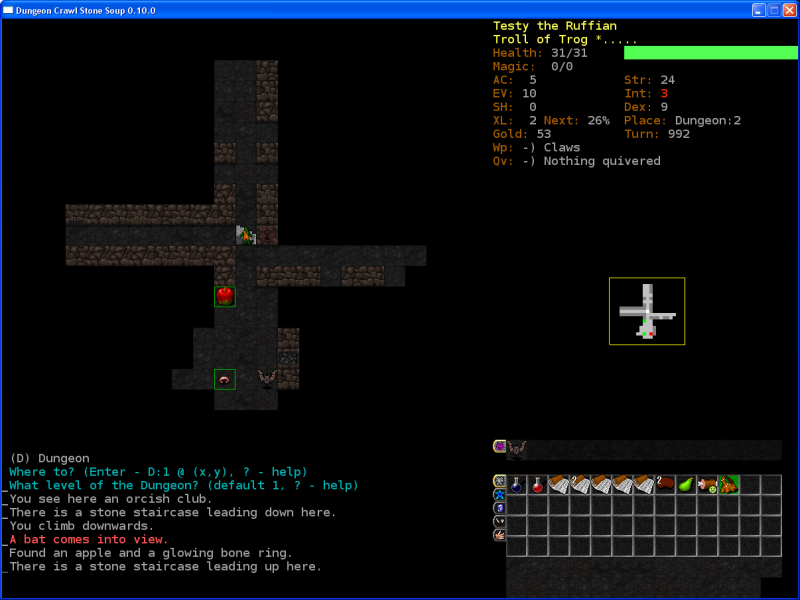 We finish exploration of D:1 and head down the stairs to see an apple, a glowing bone ring, and a bat, one of the fastest enemies in the game. 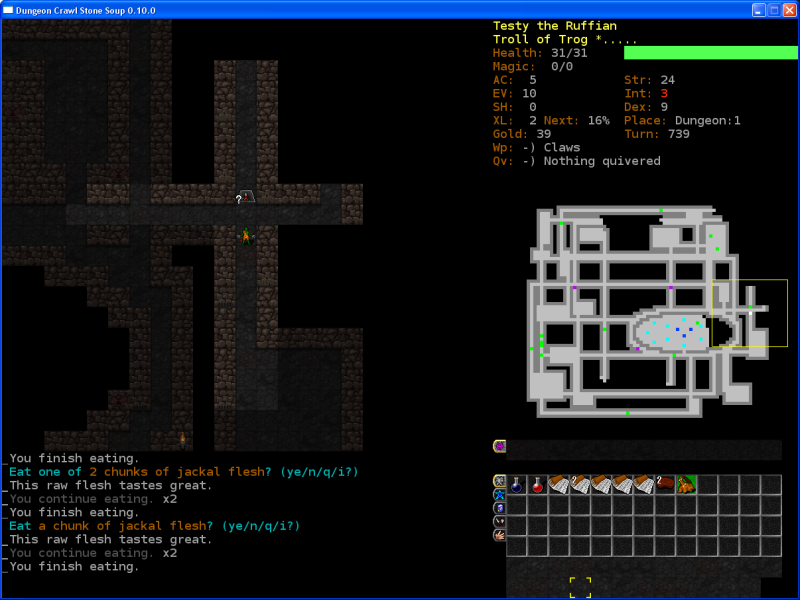 I doubt it'll be much of a challenge for testy, but the mysteries of the dungeon will have to wait till next time. Next update: The skills screen, hunger, and what all those stats mean. Also, a troll does stuff I guess. The windows bar will be gone from future updates and I plan on updating daily or close to until we get through the basics of the game.